This week’s sum-up is actually two – and comes from sunny Spain again. 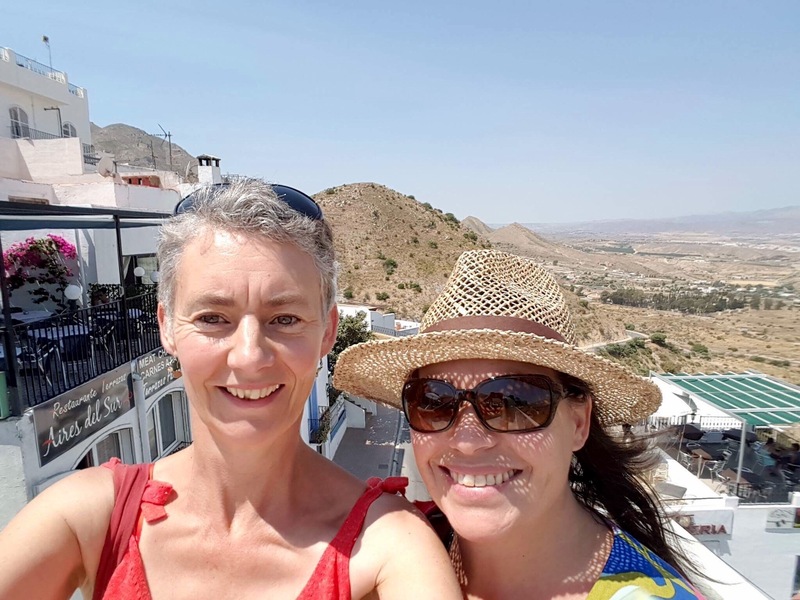 Linking up with Natalie at Threads & Bobbins who invented the original Sunday Sevens. 1. 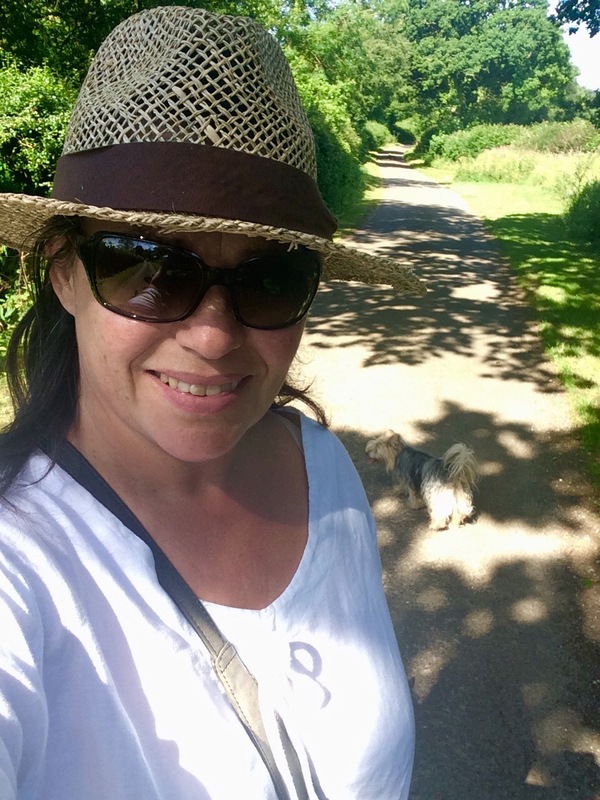 A whole week of glorious weather meant several consecutive days of dog-walking involving both a hat AND sunglasses – a rare combination in good old Blighty! 2. If you look carefully in the shadows, you can just about make out Fifi and Tess wondering why I suddenly stopped. 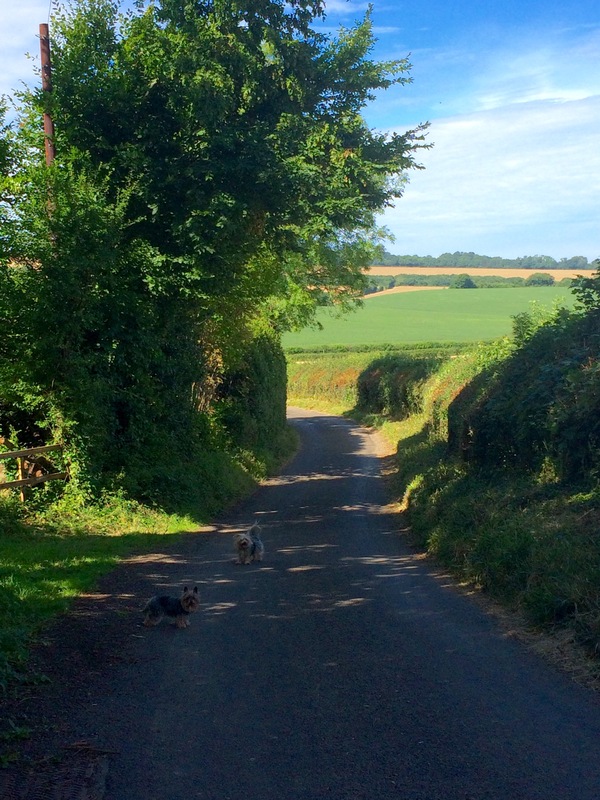 I thought I’d take a few photos of our usual five-mile route, beginning with open fields and country lanes which are always traffic-free apart from the odd farm vehicle or post van. 3. 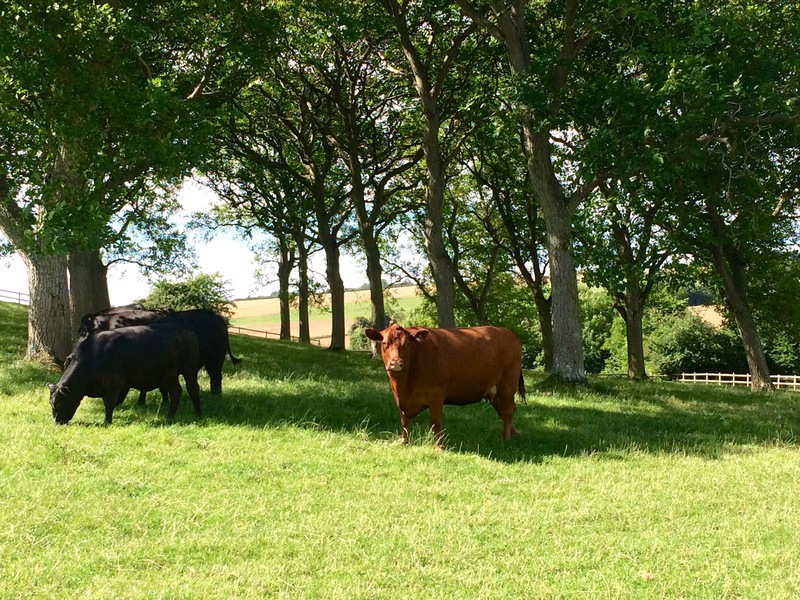 We passed some cattle grazing under the welcome shade of trees. They soon came trotting over when they spotted the dogs. 4. This farmhouse features regularly in my Sevens, most recently whilst wearing the most glorious covering of Wisteria which is now over. 5. 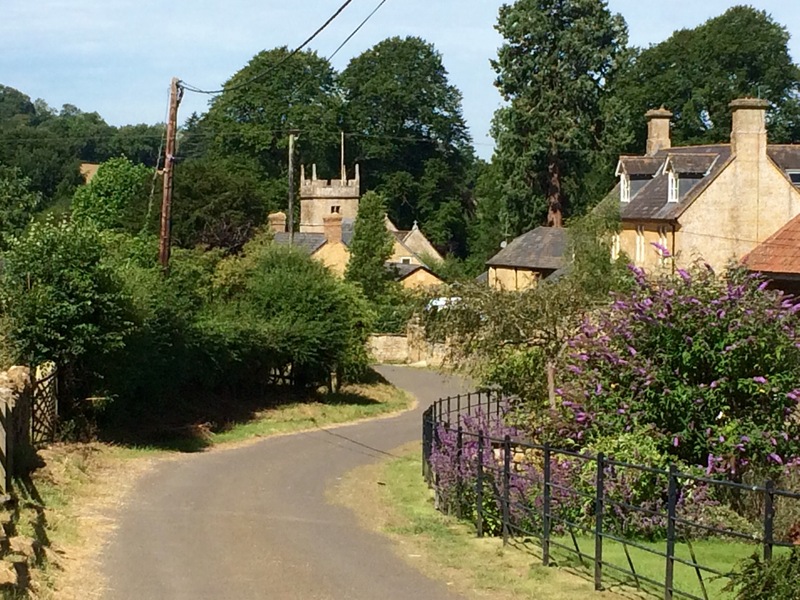 The point at which we turn around and head back towards home – the church at Blackford, our destination village. 6. 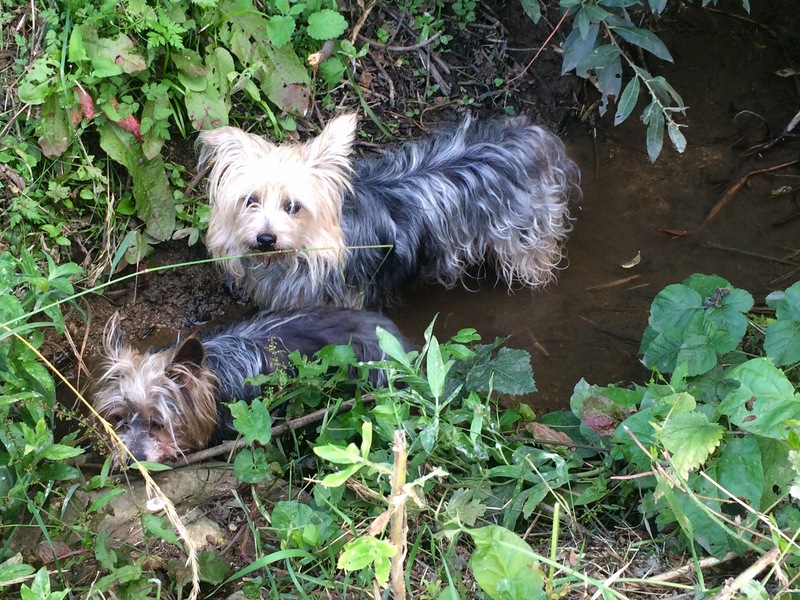 The Dogs were relieved to find a stream to cool down in and immediately jumped down for a drink. Both dogs were exhausted and Fifi spent the rest of the day snoring! 7. 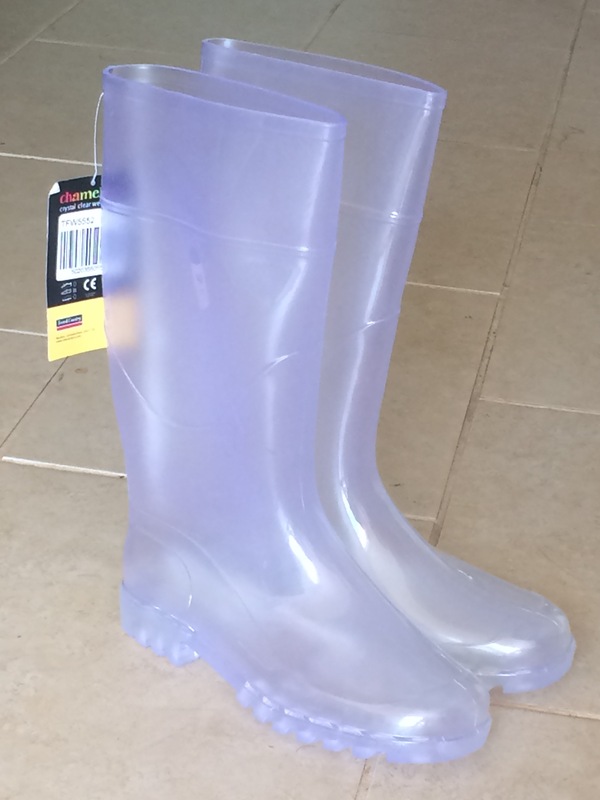 I managed to find some see-through wellies at last and ordered a couple of pairs to be gifted together with the hand knitted socks for Christmas. 8. Work on the decking has started! 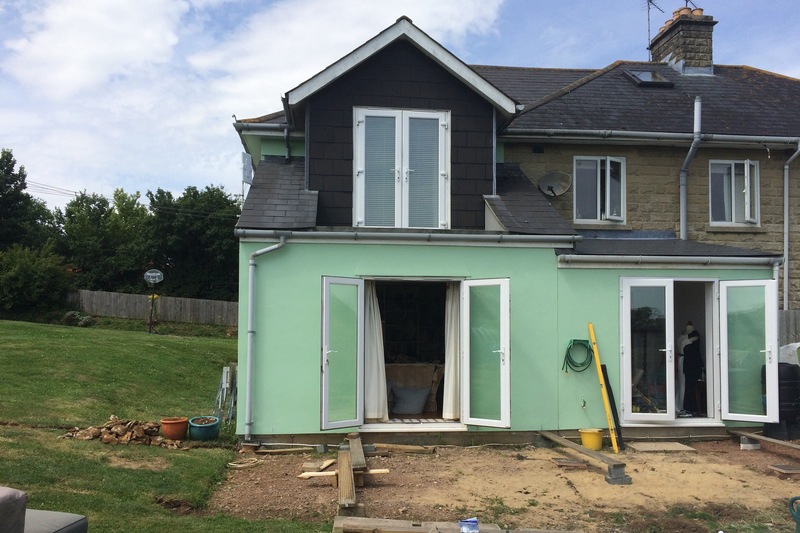 It will eventually wrap around the back and side of the house. 9. 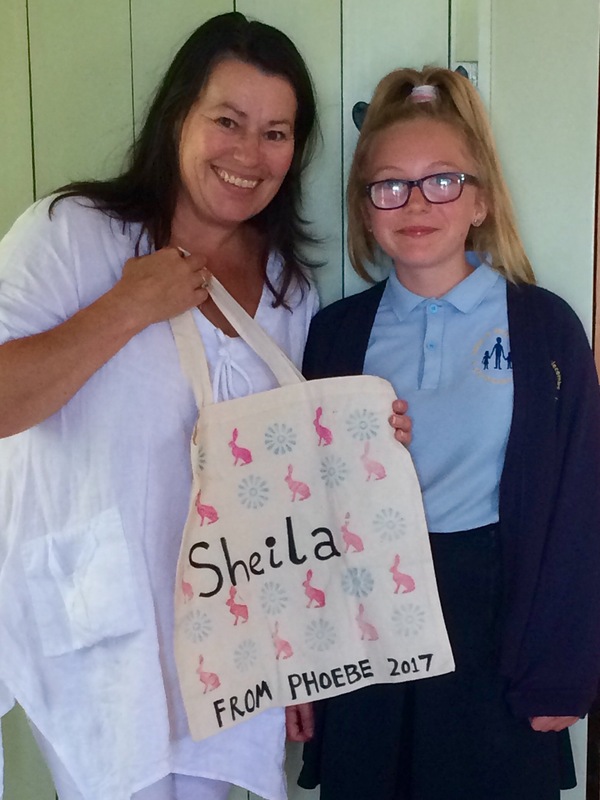 “Teachers’ gifts” are a new concept to me since my last batch of children were at school, so imagine my surprise when a student presented me with this tote that she’d printed by hand for me! 10. 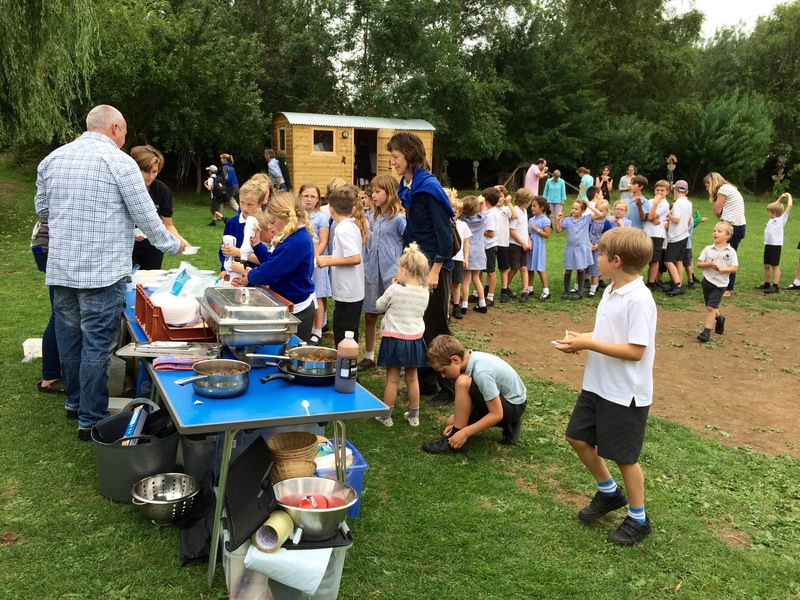 End of term barbecue at school, accompanied by a steady stream of drizzle. Well, it wouldn’t be a barbecue without rain, would it?! 11. 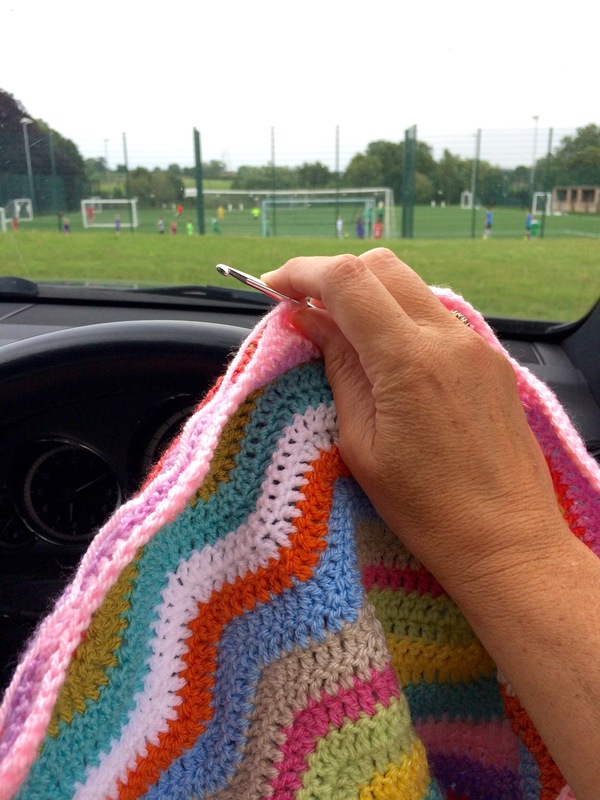 Places you can crochet: in the car whilst No.3 Son is at football training. 12. Progress on said blanket. 13. 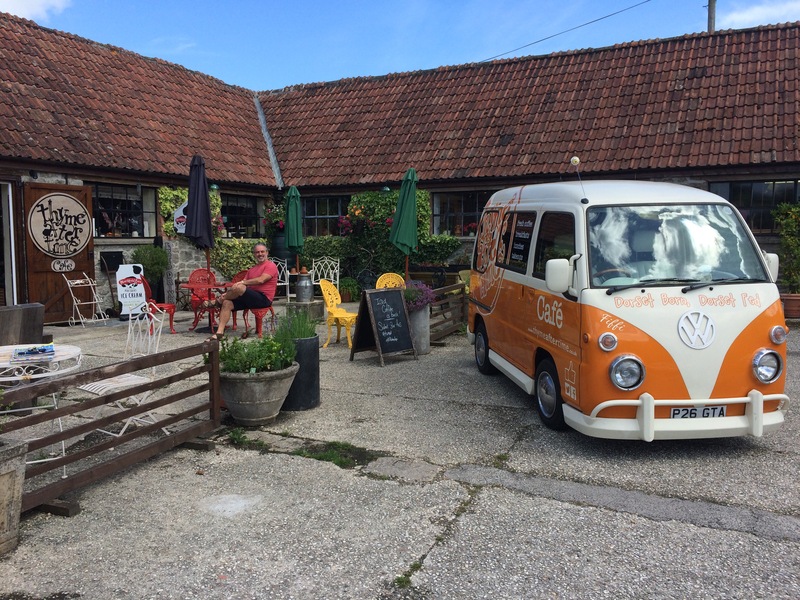 We popped in to a café which we had passed numerous times but had never actually been in. They were shooting some promotional photos and asked us to pose. Looks like we’re going to feature in their advertising! 14. 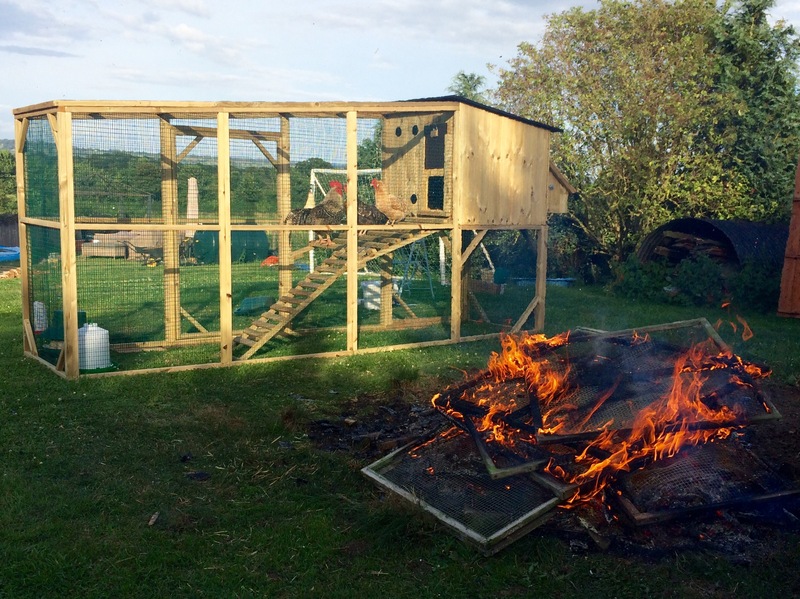 Mr H-L erected a new chicken coop and run for the hens. We just couldn’t get rid of the mites that infested the old one and decided that the best thing to do was to burn it. 15. Here it is in its final resting place at the top of the garden. The Girls are already happily laying in the nest box again, after eschewing the coop in favour of laying in the hedge in an effort to avoid the pesky mites. 16. 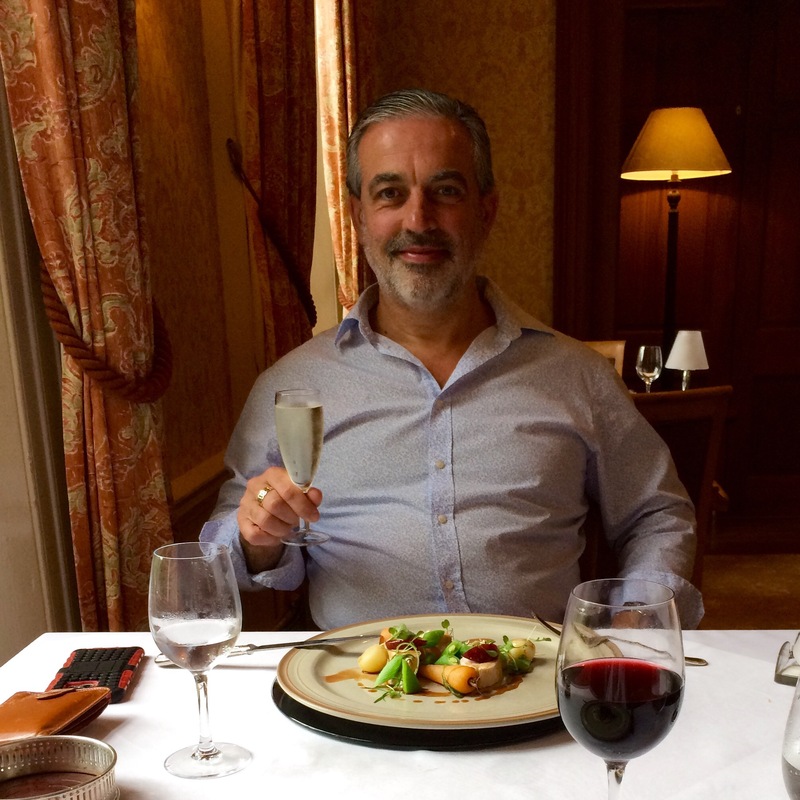 We were able to squeeze in lunch at our favourite place, Holbrook House. 17. 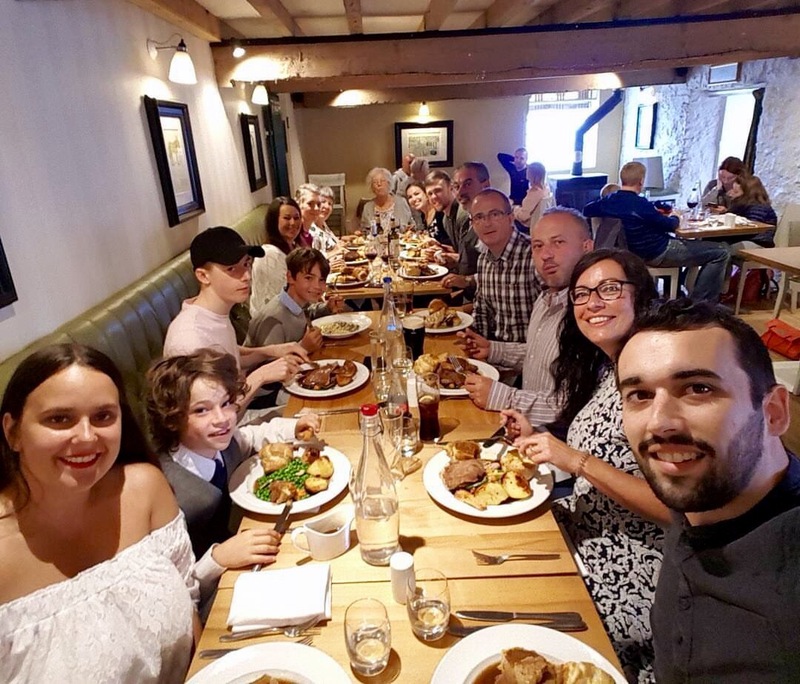 Fifteen of us met in a pub for a family meal. 18. 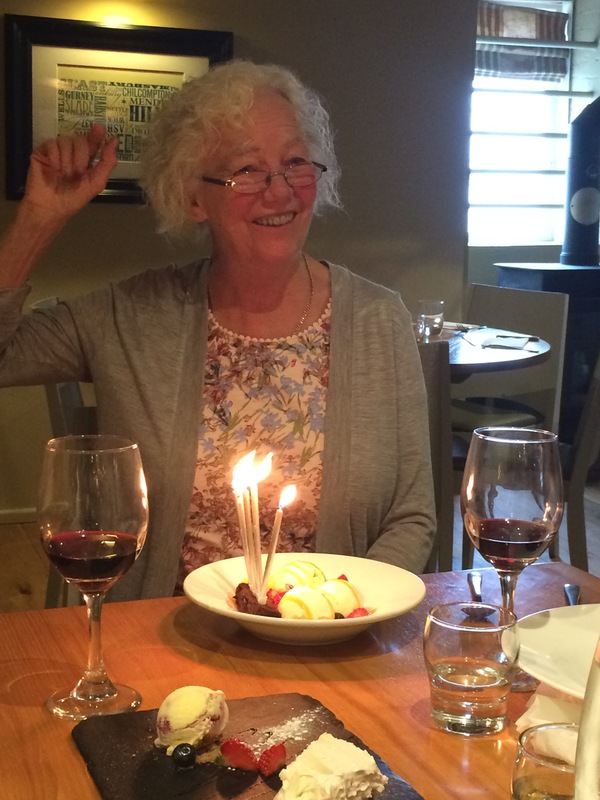 Happy 69th Birthday Mum! 19. 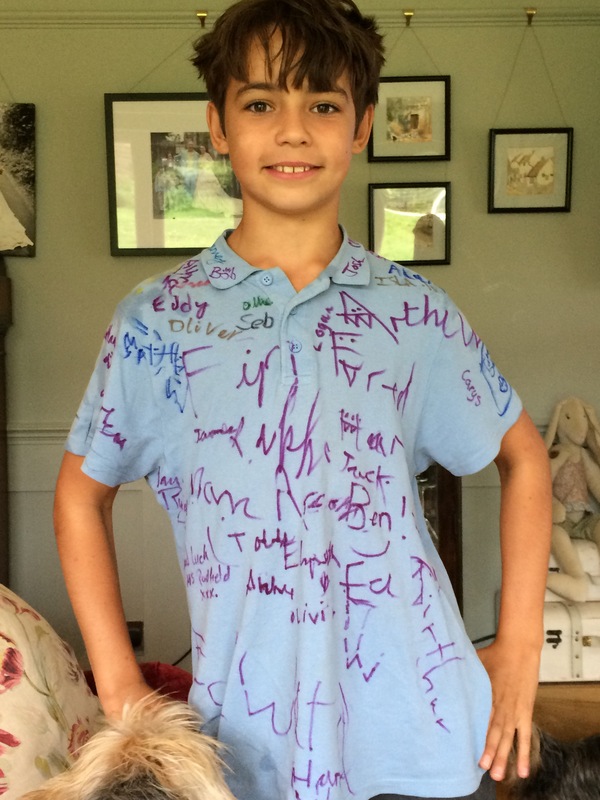 No.2 Son’s last day at Primary School. 20. 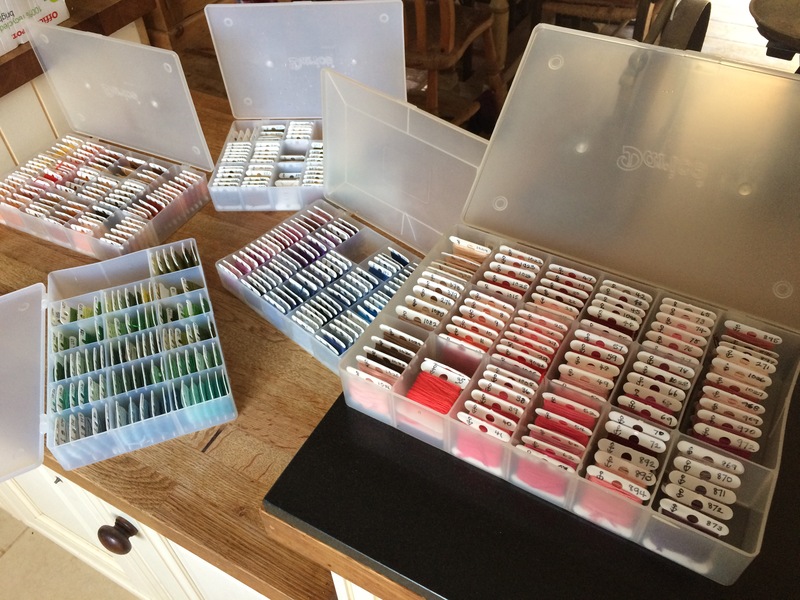 I was gifted FIVE boxes of embroidery threads, all carefully catalogued and beautifully organised! 21. Schools broke up for the Summer holidays later than most countries, on 21st July. Three days later we flew back to my Auntie’s in Spain for ten days, joined by my sister this time. 22. Mr H-L was working the whole time – here he is taking a ‘phone call on the roof terrace above the ‘casita’, his office for the duration. Nice work if you can get it! 23. Everyone needs a lunch break, though, so popping out for tapas was a must. 24. And, of course, long, hot evenings were all enjoyed together. 25. I’ll leave you pondering over one of our more adventurous tapas. Yes, it is EXACTLY what it appears to be!!! Categories: Sunday Sevens | Tags: sevens, Spain, sunday, Sundaysevens | Permalink. Love the look of the blanket, hate the look of the tapas! Your blanket is very pretty. I love the idea of the see-through wellies and hand knitted socks. Woo! That was a lot of photos! Looks a lovely walk. 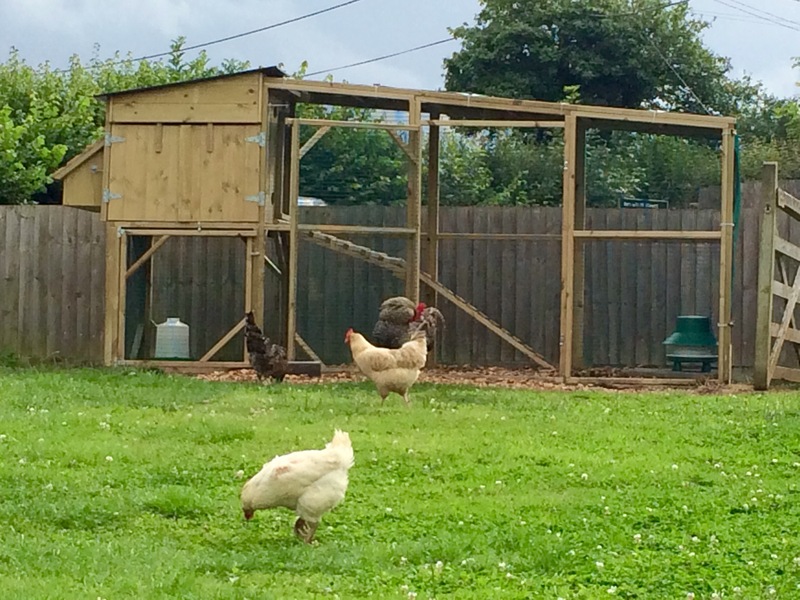 Bet the girls love their new coop. We’ve given up on having chickens, because we’ve just so many foxes and last year a plague of stoats which got through defences even foxes can’t. Lovely bag from your student. Dead jealous of all those embroidery threads. As for Spain, can you please bring some of that sunshine back with you, but I’ll pass on the brains. Belated happy Birthday to your mum! 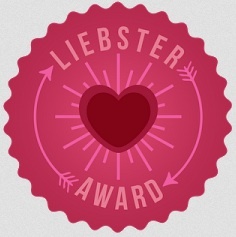 I need to go back to weekly posts, don’t I?! We’re lucky with foxes as there are so many rabbits in the fields beyond that they generally don’t risk coming in the garden for our hens. You’re not a brains girl then?! We are overrun with rabbits some years and almost always have heaps of them, but it doesn’t help. Rumour is the rescues release foxes on the moor that originally lived in towns, so aren’t afraid of people and are used to searching around houses for food. I’ve certainly seen foxes that look you in the eye and hold their ground. Did the stoats behead the chickens and then leave them? Just asking as stoats/weasels/polecats were suggested as the culprits when we lost two of our hens a couple of months ago. I can’t believe your little dogs managed 5 miles. How super is the bag your pupil made, bless her. Congrats to the number 2 son preparing for his next stage in life and what a lovely house your aunt has. Sorry but I don’t fancy that last picture one bit. 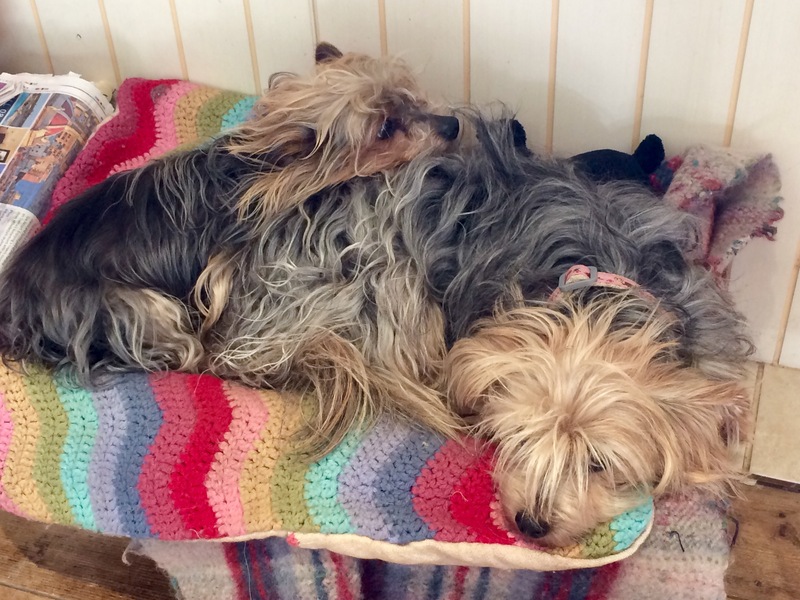 Yorkies are good like that – they’re happy to walk miles but don’t need to be walked at all. We’ve been spoiled with our Auntie’s villa over the last ten years, I must admit. I think your thoughts on brains as a tasty treat will be echoed by most of us! 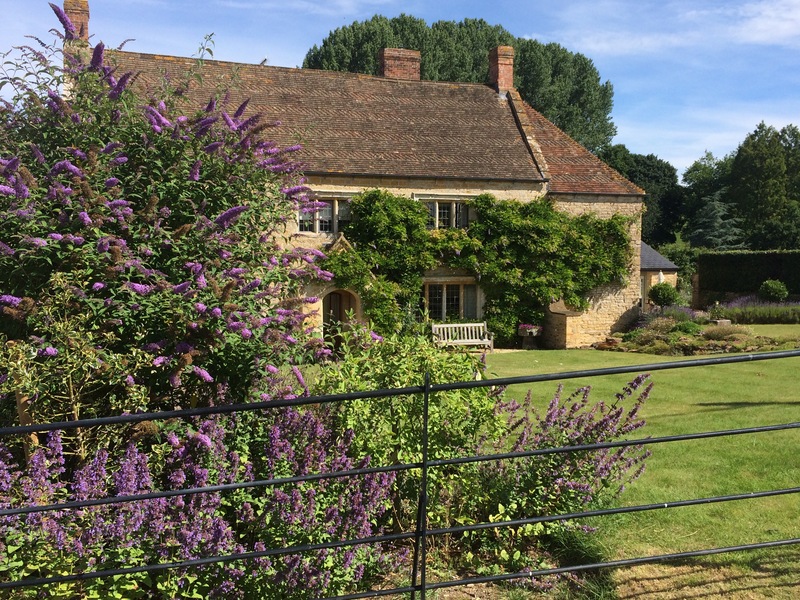 Lovely walk photos – I recall the wisteria on that cottage from past years! Sorry, but that last piccie didn’t get more’n a glance as I was downing scrambled eggs at the time. Oops, hope it didn’t put you off your eggs! I did eat a bit and it was OK, but not something I’d necessarily order again. It tasted a lot better than it looked! Beautiful shots of so many great things – until that last photo . sorry, but that’s an eeeee-ewwww from me 😀 Your crochet blanket looks really bright and cheerful, glad the hens can rest happily, I didn’t realise it is so hard to get rid of mites. 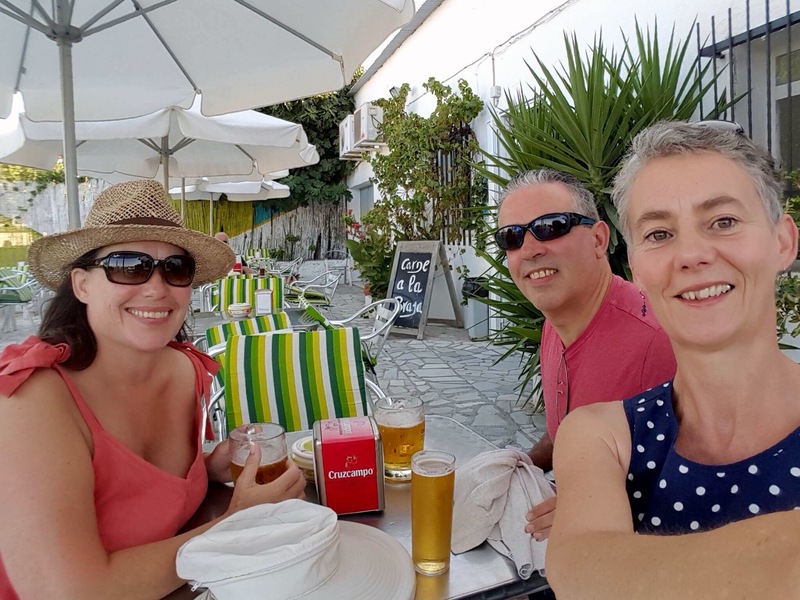 And of course any time spent in Spain has h to be good – even working holidays! Great vacation! I just love your picturesque shots. Very envious of the scenery you get. Hot nights? HA – I just spent a weekend in 104 degree heat…let’s talk about HOT. 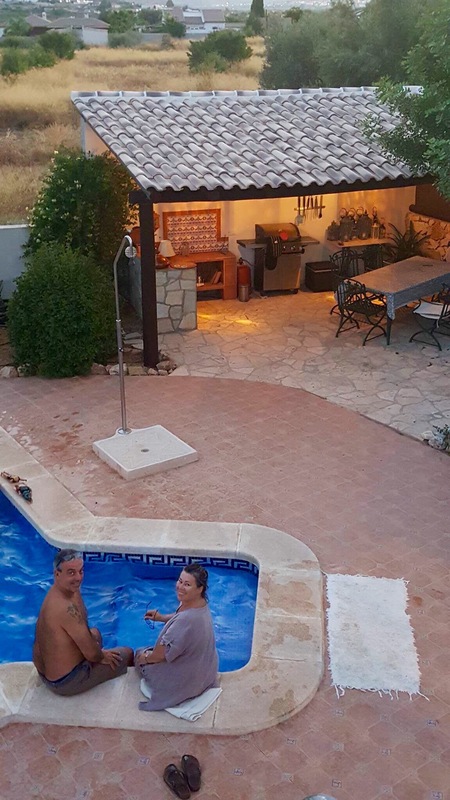 All we could do was hang out in the pool (and drink). You would absolutely die in South Texas. Your boys are growing up so fast! Happy Birthday mum! 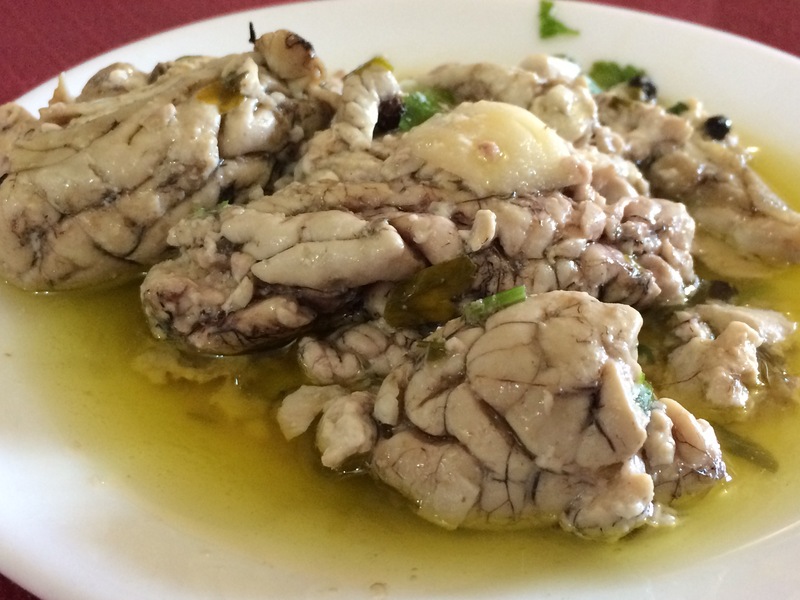 Were those intestines or brains? Either way, no gracias. Your chickens are very lucky. My neighbor bought 10 chicks in the spring and now they are beginning to lay. He was letting them out of the coop to run free in the yard but we have an owl in the back woods so now he’s down to just 7. I told his wife (who lets them out) “They don’t know an inch from a mile so best to keep them penned up.” All that was left of the last victim was a pile of feathers. Poor thing. Love the blanket! We either need to get a new chicken run or, once the remaining two have gone, give up keeping them. The jury is still out. So, it’s the big one for Mum next year then – I expect you’ll be planning something even more special than usual. The Big One for me, too, as I’ll be fifty before she’s seventy! That’ll make her feel old! I have an older sister……! A lovely update Sheila, filled with 95% goodness and…brains. Akkk! I love your sweet pooches, that gorgeous blanket and your stunning be-hatted selfie. I’m happy to see you’ve been enjoying family and friends, travel and life in general. Ha ha, I think “Akkk!” Is the general consensus when it comes to brains! 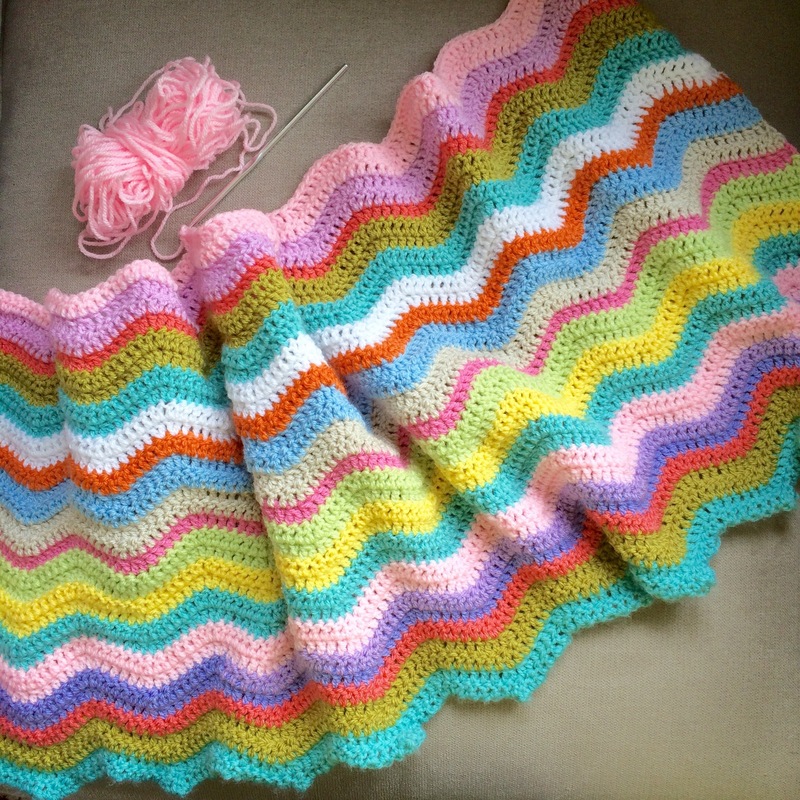 The blanket is over halfway through now and, despite my initial reservations, I think it’s one of my favourites – and I have to give it away! Off to Paris next week to stay with more family. Apparently the weather is better over there. Well, it couldn’t really be any worse than here at the moment – 14 degrees in mid August?! “Off to Paris” she says casually. Oh my you are a lucky woman. I love Paris. It’s been over twenty years. Enjoy! I hope you get the weather you’re after, too. Don’t forget, Europe is “weekend break” distance from the UK as Paris is just a one hour flight😬Although I’ve been to France since, the last time I was in Paris was 1979 on a school trip! I’m so pleased with the blanket and I’m about 3/4 of the way through so there should be plenty of time to make other presents in time for Christmas. 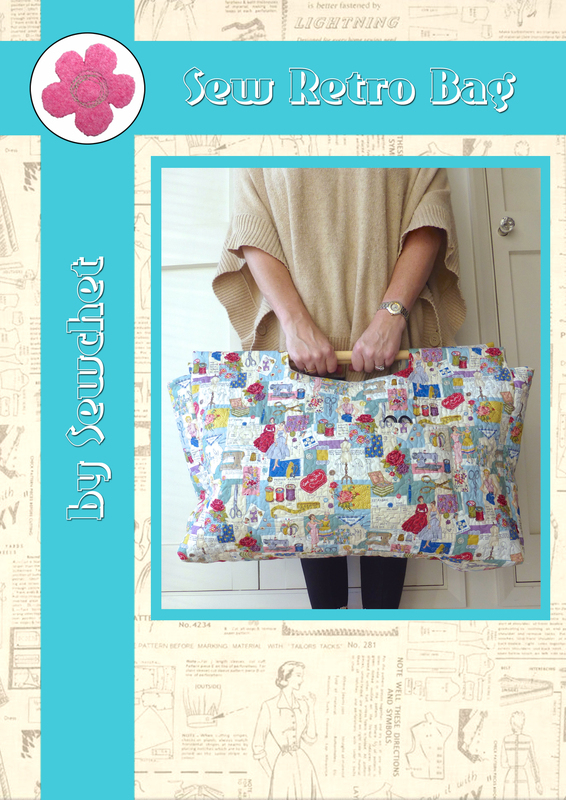 Not forgetting the Stitching Santa, of course! I seriously will NEVER have to buy another embroidery thread. And to have them already carded and colour coded for me is such a treat! Brilliant – you are so well organised! I haven’t given Christmas a thought until now 😳 eek!